Tuesday marks International Albinism Awareness Day, established by the United Nations to bring global attention to understanding albinism and fighting discrimination and stigma. Here are some facts about albinism. Albinism is caused by a mutation in genes that affects the production of melanin. It is typically characterised by pale skin, light hair and poor vision, according to the U.S.-based Mayo Clinic. Globally, one person in 18,000 has albinism, according to Standing Voice, a London-based albinism advocacy organisation. It is far more common in sub-Saharan Africa, and one person in 1,400 is affected in parts of Tanzania, the group says. In sub-Saharan Africa, people with albinism face discrimination, abandonment and poverty, according to Under the Same Sun, a Canadian-based group. Many husbands desert wives who give birth to a child with albinism, and superstition may lead them to abandon or kill their newborns. Children who survive may go to school, but vision problems lead to high dropout rates. Adults are shunned and not hired for jobs. People with albinism fall victim to ritual attacks in regions where superstition says their body parts bring power, wealth and good luck. Most victims are children, and body parts are often taken from live victims under the belief that the intensity of their screams increases their potency, according to the United Nations. More than 600 cases of attacks on people with albinism have been reported in 26 countries, mostly in the last eight years, said a U.N. report released this year. The actual number is likely higher, but reporting is hampered in part by family involvement in the attacks, it said. Violence against people with albinism is particularly severe in Tanzania, where there have been 76 murders and 73 documented attacks since 2006, according to Standing Voice. The average person with albinism in East Africa dies by age 30 from skin cancer, and only 2 percent of people with albinism live to age 40, according to Asante Mariamu, a U.S. organisation that raises awareness of albinism in East Africa. Many are unaware of ways to protect themselves from the sun or have no access to affordable sunscreen. 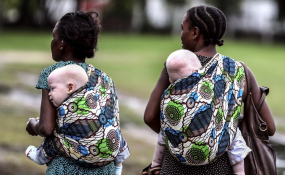 A BBC documentary released this year entitled "Born Too White" recorded discrimination and persecution of people with albinism in Tanzania and Malawi. Reporting by Ellen Wulfhorst, Editing by Alisa Tang.